Hoarders engage in excessive buying and acquiring of free items. Hoarders acquire large numbers of items that are useless and they do not get rid of. A hoarder clutters their living space so it cannot be used for its intended purpose. Sometimes, hoarders are unable to return borrowed items, leading to theft. Depression and Anxiety caused by a loss such as death or divorce. Hereditary by genetics or by growing up in a hoarding environment. 5. Very disorganized and views cleaning and organizing as major tasks. Children of those who hoard often cannot avoid living in the clutter, which affects their social lives. Children are often too embarrassed to have friends come over or the parents don’t allow them to due to embarrassment. This can lead to isolation, helplessness, and resentment. 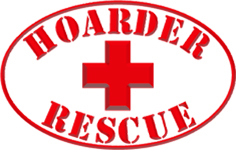 When hoarding issues exist and are hidden from friends and family, it can be very dangerous for first responders to be able to assist when needed. When Hoarder Rescue cleans up hoarding situations like these listed above, the job is completed swiftly,discreetly, expertly and usually within just days. This allows for the occupants to go back to living a normal, clutter free and healthy life.